A retirement dinner in an elegant, fine dining restaurant is a great way to celebrate the years of service, commitment and hard work for a colleague approaching retirement age. It should be a heartfelt gesture of appreciation for all the time and energy he or she has devoted to your company and deserves to be a grand company event. A retirement dinner should be a positive occasion, even though it’s basically a farewell. You want it to be an upbeat and fun occasion. And for business people in Hoboken, Dover, Upper Montclair, in Somerset and Hunterdon Counties and throughout the northern New Jersey region, no venue throws a retirement party like The Manor. It’s not surprising that dinners are an overall customary form of celebration – people like to be around one another and eat good food. That’s why retirement dinners are best held at a restaurant with a reputation for elegance, class, fine cuisine and terrific service like The Manor. For larger corporate events, where a variety of food will be needed at the retirement party for a diverse group of people, a buffet dinner is probably the way to go. For small business events that might not require such diversity, The Manor’s kitchen staff can work with you on creating a very special fine dining menu for a sit down dinner or luncheon of multiple courses. 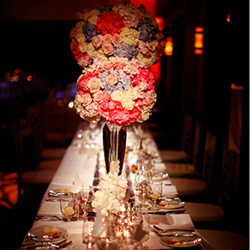 The Manor’s banquet staff will work with you on finding the right fit for your budget too. When planning a retirement dinner or business event, also consider entertainment, photographs and speeches. The Manor has a very strong group of preferred professionals, from live bands to djs, photographers and videographers as well as a top tier florist. Our corporate events planner can help choose the professionals best for the retirement party you are planning. During the entertainment portion of the dinner, an employer or good friend of the retiree will likely be giving a speech to honor the retiree, and so will the retiree him/herself. The Manor will gladly accommodate the audio and visual needs of the dinner as well as provide a lectern/podium if requested.